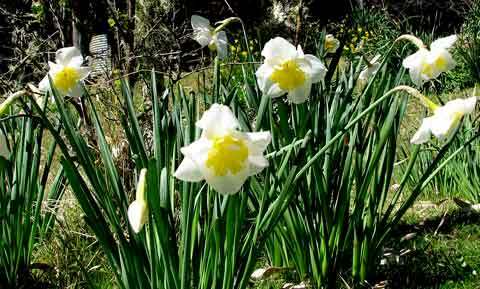 Beneath the new green leaves of the birch trees, the fading yellow jonquils and Erlicheers and the fresh yellow and white daffodils — whose name I’ve forgotten — quietly clump and multiply and delight each year. The iris aren’t so prolific. 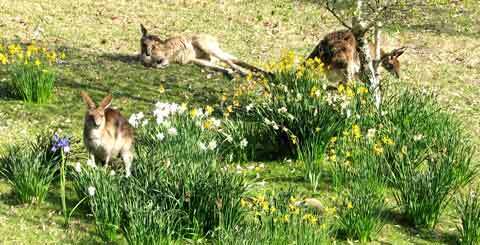 I was amused to see the kangaroo family choose this little grove of flowering bulbs for a munch and a snooze in the sun. They are quite delicate in eating the native grass between the bulbs without flattening much. I am so grateful that they don’t fancy bulb leaves or flowers! 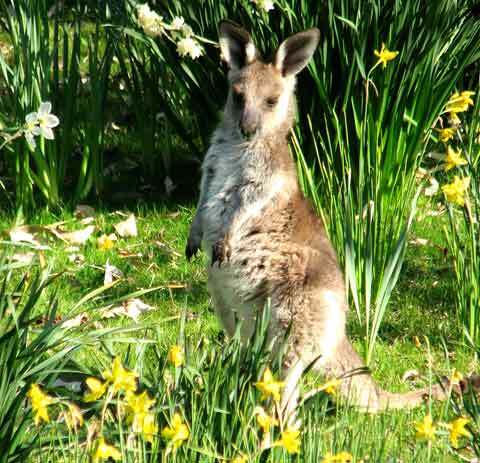 The joey had been asleep in the centre of the flowers, but popped up to peep over and check out the world as I watched. Not too tough a life in this refuge.